One day I was hungry, but didn't know what to eat. I opened the fridge and saw I had some apples, a few cucumbers and some bacon. 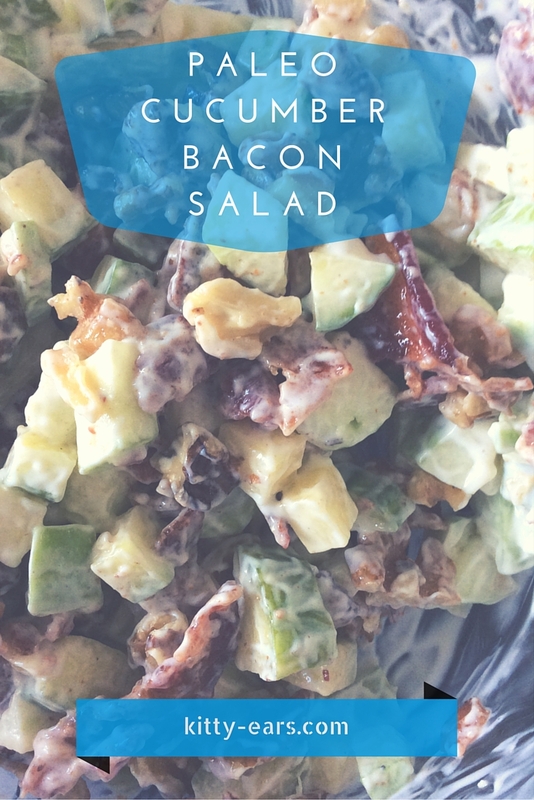 Thus the paleo cucumber apple bacon salad was created! I baked 6 strips of bacon in the oven (20 minutes at 350 degrees f) until they were fairly crispy. I like my bacon crispy! Then I chopped up two small green apples and a large cucumber (the same amount of apple as cucumber, a 1:1 ratio), shredded the bacon into small pieces, and combined it all with a pinch of salt, pepper, and a teaspoon of chili powder and about a 1/2 cup of paleo mayo. It made enough for three servings, and the combination of sweet green apples and chilled cucumbers and the salty bacon with the spicy powder is divine! I am sure I am not the first one to think of this, but to me it was an amazing discovery, and an awesome snack for a hot summer day!